Written by Janet Choi on January 29, 2015 . Why does emotion work so well and how do companies like Apple use it to create such strong connections? In a world bombarding and blasting you with messages competing for your money, time, and attention, real emotion is what cuts through the noise and lasts. It’s what you have at the end of the day. Amazingly, marketers can create emotional memories and resonance in a relationship that, let’s face it, usually starts out and often stays pretty indifferent. Researchers at USC Marshall School of Business examined what it is about brands like Apple and Manchester United that captures people’s hearts and discovered that they reduce the psychological distance between themselves and the consumer. Basically, brands get up close and personally meaningful. There are 3 factors — the “3 E’s” — that go into building closer emotional attachments by relating to people’s sense of self: enticement, enablement, and enrichment. And it turns out that these factors are an even better predictor of actual purchasing behavior than what people self-report on what they’d do. Enticement appeals to aesthetic needs and the senses. As the researchers explain, entice with “any combination of sensory experiences — visual, auditory, gustatory, tactile, olfactory, thermal, and/or kinesthetic.” Starbucks, for example, designs an experience that’s all-around pleasing to the senses. You walk in and smell freshly-ground coffee, sit on comfy chairs, hear soothing music, see tranquil colors, taste pumpkin spice flavored things. That overall experience is part of its brand and why people return to get their fix. Enablement appeals to functional needs. By creating a sense of efficacy, you tap right into people’s emotions about themselves. To repeat Hulick, “people are buying better versions of themselves.” Whether it’s a fancy chef’s knife or an app on your phone — if a product helps you get stuff done, you’ll relish that autonomy and sense of control. That’s a pretty great feeling. Enrichment appeals to spiritual and self-expression needs. This factor is the most abstract but perhaps also the most powerful. Brands that resonate with your values and reflect a sense of yourself and your aspirations feel inherently personal. Take TOMS, a brand known for giving away a pair of shoes to a child in need for every pair you buy. When people purchase and wear TOMS, they’re fulfilling a do-gooder identity that they crave. Whether it’s TOMS or a luxury brand — when you are what you buy, you’ll most likely love what you’re buying. Emails are an ideal medium for creating emotional resonance with customers. After all, email is all about people and relationships. To bring you closer to your customers, consider how much value they can experience regarding the 3Es of enticement, enablement, and enrichment in your emails. Here are a few examples of companies delivering on those 3 E’s to create memorable emotional connections and in doing so, create effective marketing. Warby Parker’s emails regularly tap into enrichment by featuring hip glasses at hip prices, appealing to people who identify as trendy but down-to-earth. 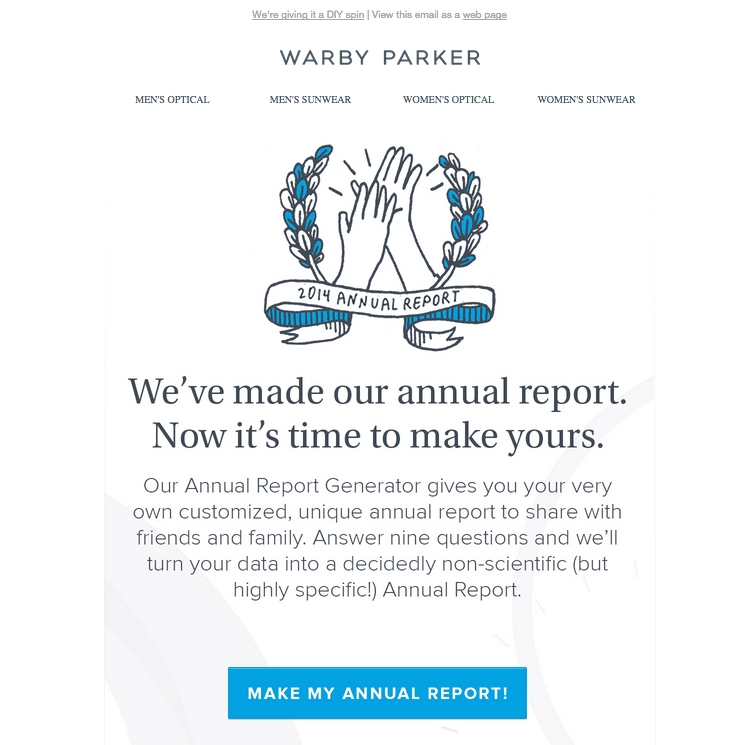 In one of their year-end emails, they play into that self-expression appeal even further by timing the company’s annual report with the chance for their audience to make their own quirky, charming annual report. Poncho delivers personalized weather reports based on your routine and preferences (it’s only available in some areas right now). 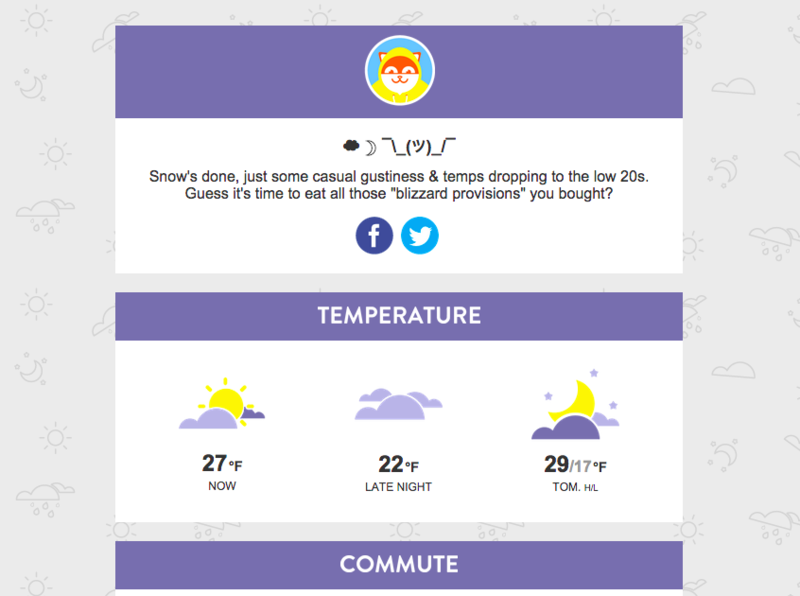 Poncho’s emails appeal to the senses with cheerful bright colors, clean layout, and adorable poncho-wearing cat mascot. Since Poncho emails are highly functional, reliably preparing me for my day and night, while also offering jokey, often sympathetic copy and the occasional excellent GIF — I’ve become quite attached to these twice-a-day emails. Educational content and email courses are great for connecting with people by delivering enabling value. Kollecto is a service that delivers personalized art recommendations to start and grow an art collection. Like many other sites, Kollecto offers a free course to get people to sign up for its email list. (Unlike many others, I’ve opened and enjoyed every single email.) The month-long course on affordable art is fun, informative, and pulls you into what Kollecto is doing as a business. 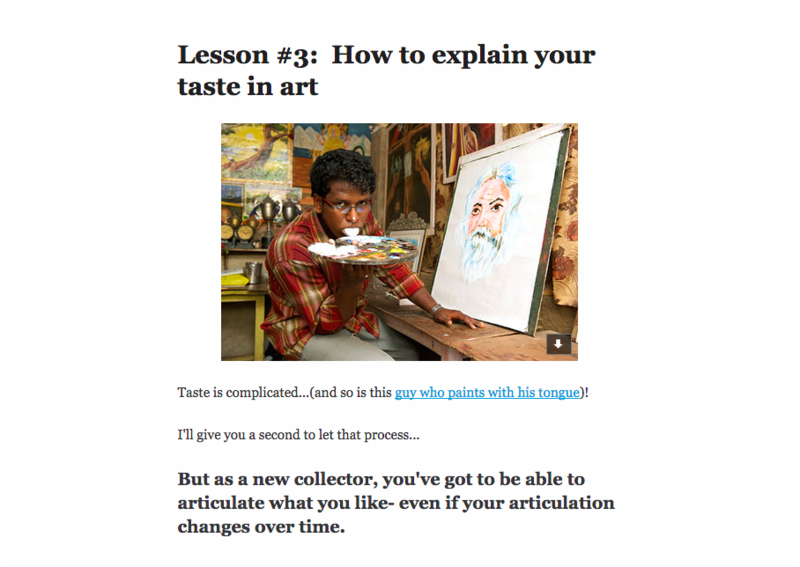 The 3rd lesson, for example, teaches you how to describe your tastes in art. Then, if you submit what you come up with, a Kollecto art advisor will find 3 pieces of art based on what you wrote. By both enabling and getting you to participate in a personal process, Kollecto accumulates some great heart share points. 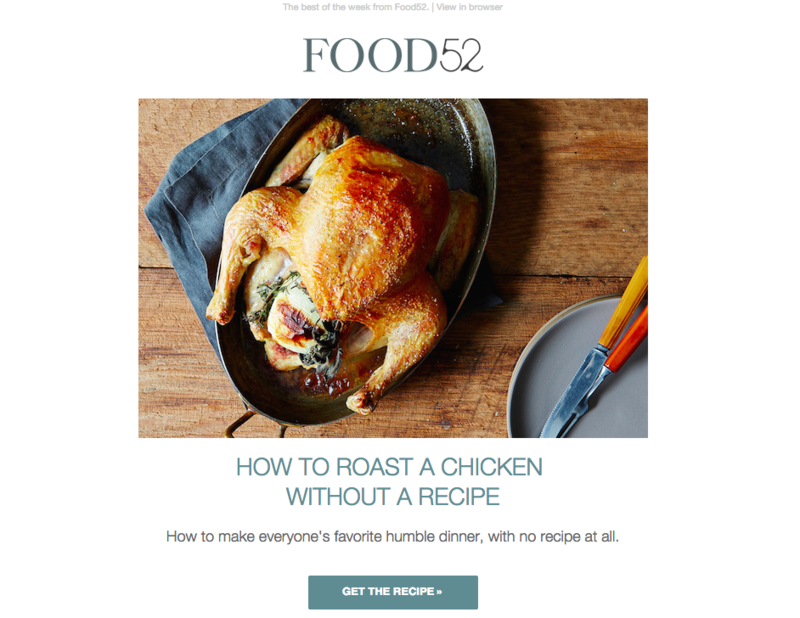 Food52’s emails feature beautiful, mouthwatering photography. With a minimum of copy and soothing color scheme, the aesthetics here all focus on the food, and their emails tend to make me want to dive into the pictures themselves. I’m sure they’ll settle for the available reality of diving in via clickthrough. While the most direct way emails can entice the senses is visual design and images, don’t forget the power of words to create a sensory or emotional experience. 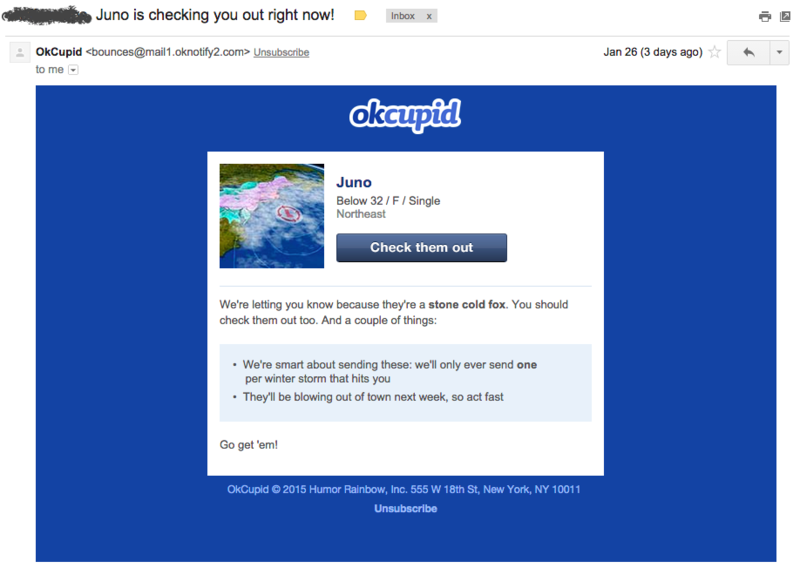 Take this email I got from OkCupid telling me to check out a certain stone cold fox named Juno. It was a funny, entertaining little email that got me to click through to the site and like the brand a little more for the experience of the joke. When marketing emails blast and urge and push and hype, customers feel disconnected, tune out, and unsubscribe. You can’t deliver value by only talking about and appealing to your own self. Remember, to get people to love iPhones so much, Apple doesn’t talk up its technical specifications, it tugs at the heartstrings by showing you the possibilities of what you can do. Create emotional affinity by creating value and meaning. When you strengthen emotional attachment with your customers by appealing to the senses, level up their awesomeness, and enrich their identity, you’ll start to win over their hearts. 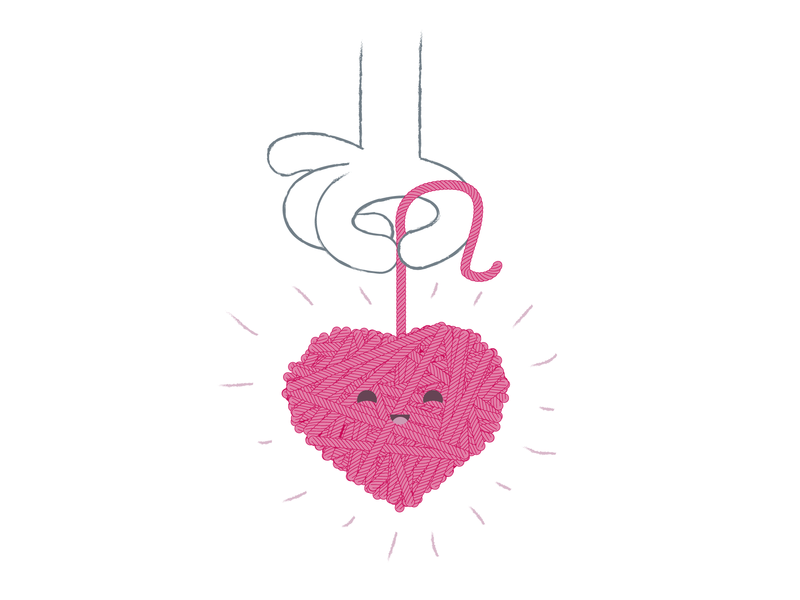 What brands do you feel strong emotional affinity (or aversion) for? We’d love to know!